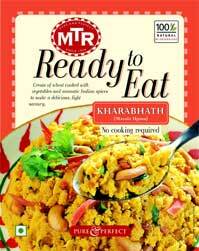 MTR's Khara Bhaat is made up of Cream of wheat cooked with vegetables and aromatic Indian spices to make a delicious, light savoury. Serve for breakfast with coconut chutney. How to make: Transfer the content of the foil pouch into the microwave safe bowl, microwave on high for 1-2 minutes and serve hot Immerse the unopened foil pouch in boiling water for about 5 minutes. Remove, cut open and serve hot.